Cornered Production Blog #3: Days 2 and 3! Whew. Things are happening fast. This month is the last major month of filming, but I have to say things are looking good and our actors…they are just awesome! A page dedicated to Cornered will be going up soon, with the cast bios and much more! Preparing to shoot a scene outside a Federal Courthouse downtown! Anyway, Day 3 found us working in front on of the Federal Court House in downtown Austin.Once again I found myself acting this day (don’t worry, I’m not the star!) with the wonderful Lindsey Lemke. Things went smoothly, but we did have an issue with a feisty grackle, and Lindsey decided to tempt fate, the video of which you can find on our Facebook page! Also providence smiled on us as, during filming, we ran into a duo of break dancers who were blocking out their shots for a music video they were about to shoot. We took a short break so we could talk with them, and it resulted in one of them, the very talented Yuki Ishiguro, joined our cast! We were lucky to find him! 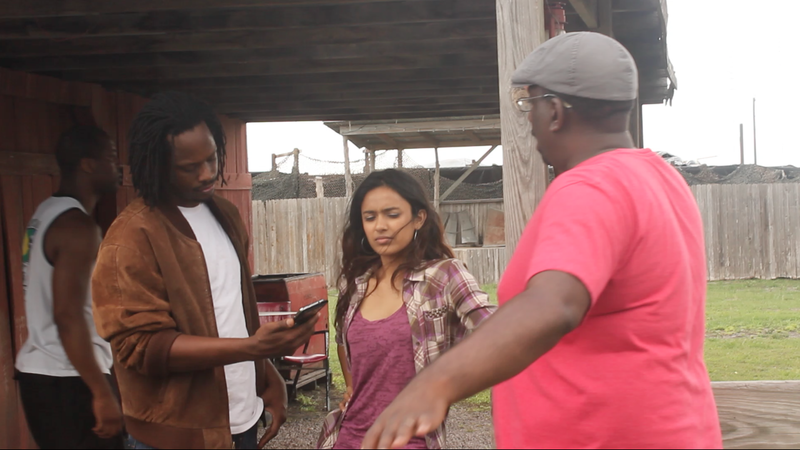 Donald Brooks and Sharmita Bhattacharya listen while I explain the next shot. Director Michael S Moore and Lindsey Lemke going over the next scene. So that’s all for right now! Next time I’ll review how Day 4 and 5 went, and with some great production stills here and on our Facebook page! Next time I’ll introduce the bad guys! Previous Eric Jacobus presents: Can You Kick it? Kicktionary: 200+ movie kicks!